With a silly name like Resident Evil, it could not be anything else but the name of a Japanese video game. Ironically, the game is originally called "Biohazard" in Japan, which is significantly less silly. The game puts you in the roles of police officers investigating the source of a viral outbreak that turned the inhabitants of Raccoon City into reanimated corpses, also affectionately known as zombies. Armed with a vast array of modern weaponry, you explore a spooky mansion filled with a menagerie of zombies and strange creatures that escaped from the secret laboratory complex underneath the ground. The villain is a faceless global conglomerate known as the Umbrella Corporation, responsible for conducting illegal experiments that led to the outbreak. 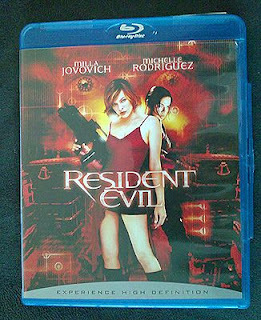 The movie explores the same world but from the perspective of Umbrella employee Alice (Milla Jovovich), who lives in the aforementioned mansion. She is unconscious, alone and amnesiac when she first appears at the beginning of the outbreak. Circumstances forced her to join a group of mercenaries hired by Umbrella to investigate the sudden loss of communication from the secret laboratory. In tow are fellow amnesiac Spence (James Purefoy) who may be connected to Alice in some ways, and Matt (Ugly Betty's Eric Mabius), a cop looking for his sister who works in the lab. As with all "haunted house" movies, the assorted bunch of characters are stuck in the building, and must find a way to survive and escape the place. Most of them won't. Like the game, Resident Evil is an amalgamation of horror, sci-fi and action that somehow works for me. Maybe it's the entertaining action/horror sequences, or Michelle Rodriguez wisecracking, or just Jovovich being such great eye candy. To her credit, Jovovich also brings some level of unexpected badassery to a female role that is always rare in movies. Like any good male action hero, she takes charge of bad situations, gets physically roughed up, and chambers a round in a shotgun like she means it. There are also some clever ideas to be found, like the way the character's amnesia is used to reveal key events. You can say that Resident Evil is no different and no less sillier than movies like Clash of the Titans and The Mummy, except that its action sequences have a little more kick to it since the violence is not restrained by a family-friendly rating. Personally, I found it entertaining enough to rewatch numerous times on Blu-Ray. Others may wish to proceed cautiously, since enough critics have hated it. The Blu-Ray: It's great to revisit the movie and find everything so sharp and detailed. I can finally read the small prints on the Red Queen cam. The disc also contains all of the special features from the special edition DVD, including the entertaining audio commentary by the cast. I didn't notice anything that is missing. The pop-up menu looks appropriately tech-y, but I've seen better. I'm no sound aficionado, but as long as there's some surround effects and strong bass for gunfire and explosions, I'm good. 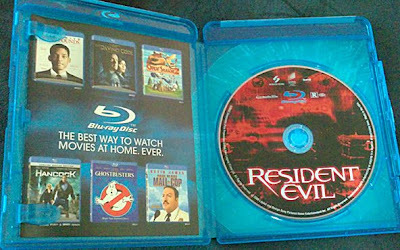 The case is about as creative as any other Blu-Rays in the market, with nothing except the disc plus one promotional (and completely disposable) slip inside the case. Watch out for the spoiler-iffic picture at the back of the case.